Riding to work on BART, about a week before I was to begin shooting this story, I ran into a former colleague of mine whom I had not seen since 2001. He and I had worked together for something like 9 years at KUSF, a non-commercial community radio station in San Francisco. The station -and this particular guy- have always had a reputation for being fairly progressive. OK, that might be an understatement: he’s a militant vegan, Critical-Mass-bicycle-riding, anti-automobile, bleeding heart liberal who played a lot of 60’s Psychedelia and Prog Rock like the Fugs, the 13th Floor Elevators and Frank Zappa on his radio shows. After explaining to him that I was working on a story about the impact that global warming is having on the Earth’s supply of fresh water, I was shocked to find myself arguing with him about the very existence of climate change. He claimed that it was all a bunch of sensationalism and that the Earth’s climate has always had dramatic changes and that what we are experiencing now is anecdotal and has nothing to do with humans. He said that even if it is happening, longer growing seasons in northerly regions would be beneficial to world food supply and that an increase in carbon dioxide in the atmosphere would cause plants to grow even better. Sure, I’ve heard these types of arguments before but usually not in San Francisco. It was definitely a timely reminder to me about why the media should cover the kind of scientific work that’s being done on this issue. Given my conversation with BART guy, one of the reasons the Keck Hydrowatch Project is so interesting to me is that Inez Fung, Todd Dawson and the rest of the team aren’t actually setting out to prove the existence of climate change. The researchers are embarking from the position that without question, global climate change is happening and what we are experiencing today is just the tip of the rapidly melting iceberg. And you know what? I believe them. So, they are dedicating the next four years of their lives to understanding how these changes will affect the availability of fresh water for use by humans, plants and land animals. So far, their predictions are “rather grim”, as Fung says in the story. It will rain but because we’ve cut down so many forests, altering the natural landscape that allows the water to cycle back into the atmosphere, much of it will fall in the middle of the ocean where we can’t access it. This will result in widespread drought and famine in the not so distant future. Yikes. Being an environmental reporter in this day and age can be a bit disheartening. So, I was curious how scientists like Fung and Dawson, whose research leads to predictions of widespread climatic chaos and environmental meltdown, are able to cope with their frequently depressing findings. And what do they hope to do with their results? Well, according to Todd Dawson and others on the Keck Hydrowatch team, this project can serve as a model for understanding water movement throughout the globe in order to more fairly allocate water for future human use in a dryer world. But also, and perhaps most importantly, this research can drive home the point that because climate change is largely the result of human activities, its solutions also reside with us. 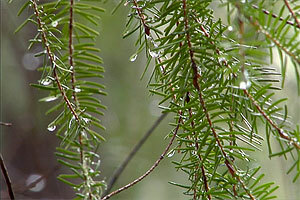 Watch the “Tracking Raindrops” TV Story online, as well as find additional links and resources. Amy Miller is a documentary filmmaker and the Supervising Producer and Partner at Spine Films, a boutique production company specializing in science, natural history and art content. Prior to joining the Spine team, she worked at KQED as the Series Producer of “QUEST”, a multimedia science and environment series. She was also a staff producer for two other KQED series, “SPARK” and “Independent View.” For her work in television, she’s earned multiple honors including ten Emmy awards and two AAAS Kavli Science Journalism awards. Feature Producer/ Director credits include “Saving Otter 501” for PBS NATURE and “Let All the Stories Be Told” which aired as part of KQED’s “Truly California” series.